Deliver an Easter feast that your family and friends will cherish for years to come. 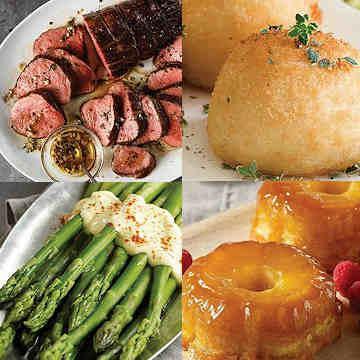 Serve them the Essential Easter Roast Collection brings together some of our finest Easter offerings, from our gloriously tender and savory Chateaubriand Roast, oven-ready Asparagus Spears with Hollandaise Sauce, Individual Pineapple Upside-Down Cakes for dessert, and more! This feast has a little something delicious for everyone at the table - PLUS it includes a FREE Boneless Smoked Ham. Grab this combo today to savor a worry-free, effortless Easter! Do Not Thaw! Oven: Preheat oven to 425 �F. Place desired number of servings on a foil lined or nonstick baking sheet allowing approximately 2 inches between pieces. Bake for 25-30 minutes. Microwave: Place 1-2 portions on microwave safe dish. Microwave on high power for approximately 1-3 minutes. Do Not Thaw! Microwave: Remove cake from box and plastic film. Place cake right side up in its cup on a microwave safe plate. Microwave on high for 55 seconds. Immediately invert cake on serving plate. Release cake (without removing it from cup) by applying pressure to the bottom of the cup with thumbs while gently pulling up on the edges. Let stand for 3-5 minutes before removing cup and serving. Oven: Preheat oven to 350� F. Remove cakes from box and plastic film. Place cake right side up in their cups on a baking sheet. Bake for 14-15 minutes. Immediately invert cakes on serving plate. Release cakes (without removing them from their cups) by applying pressure to the bottom of the cups with thumbs while gently pulling up on the edges. Let stand covered by the cup for 3-5 minutes before removing cup and serving. Thaw in refrigerator. To Heat: Place in preheated 350�F oven, cover and heat for 40-50 minutes. To Serve Cold: Thaw, slice and serve. Ingredients: Beef. These products are processed in our plants in Nebraska, USA after undergoing a strict series of quality checks and under the supervision of the United States Department of Agriculture. Ingredients: Potatoes, Milk, Bleached Wheat Flour, Canola Oil And/Or Soybean Oil, Water, Modified Food Starch, Contains Less Than 2% Of Corn Flour, Enriched Bleached Flour (Wheat Flour, Niacin, Iron, Thiamin Mononitrate, Riboflavin, Folic Acid), Guar Gum, Salt, Spices, Dextrose, Hydrolyzed Soy Protein, Yeast, Yeast Extract, Natural Flavor, Sugar. Contains: Milk, Soy And Wheat.